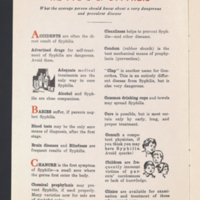 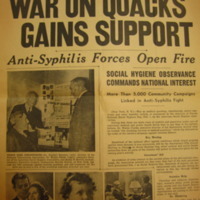 This photograph shows a anti-syphilis display in a drugstore window for National Social Hygiene Day. 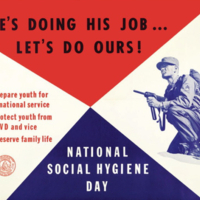 This poster is promoting community participation in National Social Hygiene Day. 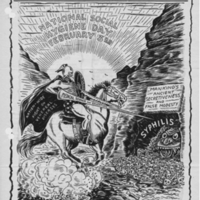 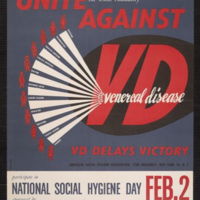 "Unite the Whole Community Against VD"
This is a promotional poster for National Social Hygiene Day that urges community participation to help support the war effort. 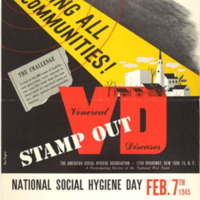 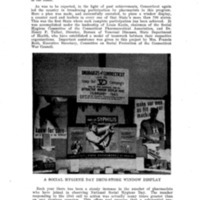 This poster urges community participation in VD control to strengthen the war effort. 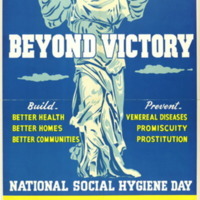 This version has been personalized for use by a industrial health program in Fort Greene, an area in Brooklyn, NY. 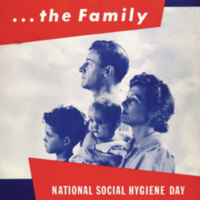 This poster promotes National Social Hygiene Day as a way to protect the family. 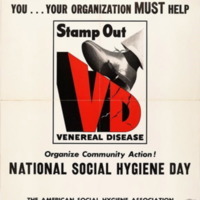 This poster urges communities to get involved in National Social Hygiene Day to help eradicate VD. 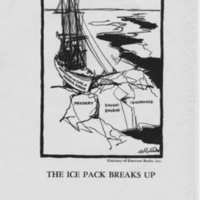 "The Ice Pack Breaks Up"
This National Social Hygiene Poster features a cartoon that shows the ship of "prevention and cure of venereal disease" breaking up the ice pack of "prudery," "shush! 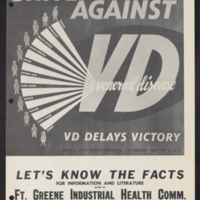 shush!," and "ignorance." 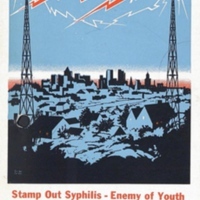 "We Can Get the Beast Out of His Lair We'll Win the Fight"